This has been a long time coming and I'm happy it's finally here! 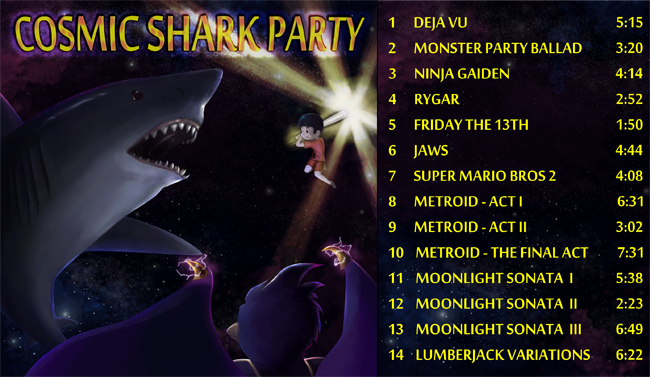 This is COSMIC SHARK PARTY, a full-length (1 hour) collection of my best and favorite arrangements, all newly recorded on my Kawai CA-65. Thanks to all you guys for the years of support. I am sure that this is the best product under the Kareshi name in all the years I've used it. MP3s are a free download. Physical CD is still available for $10 plus $3 shipping. Link below. >Download the liner notes for insight into the selections and full credits.